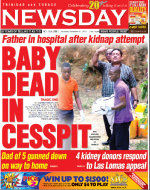 Published on May 31, 2016 in Crime in T&T, General T&T, Kidnapping, Law, Media, Murder and Violence. 4 Comments Tags: Crime in T&T, Express, Vindra Naipaul-Coolman. EIGHT of the ten men on trial for the murder of businesswoman Vindra Naipaul-Coolman, were found not guilty of the crime this afternoon.